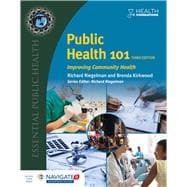 Public Health 101: Improving Community Health, Third Edition provides a big-picture, population perspective on the determinants of health and disease and the tools available to protect and promote health. Now with a greater emphasis on community involvement and providing community based-services, the third edition examines the full range of options for intervention including use of the healthcare system, the public health system, and society-wide systems such as laws and taxation. Through a unique set of case studies, vignettes, and extensive examples, readers will come away with a clear understanding of how public health affects their everyday lives. They will learn and apply frameworks for thinking about public health issues and gain a deeper understanding about the health news they are exposed to each day. Public Health 101 is part of the Essential Public Health series and one of the three Health Foundations courses. Public Health 101 follows the ASPPH "Critical Component Elements" for a public health overview course as well as the AAC&U recommendations for a Public Health 101 course.